Orthobion offers a full line of interbody fusion devices featuring its unique FGOIC Ti surface technology whereby the devices are designed to promote bone growth, optimized intervertebral stability, while allowing for improved bone - healing characteristics. Starting from pure PEEK Optima® material, a unique biomimetic imprint consisting of a Proprietary Engineered Surface Topography in both the micro and nano scale is applied. 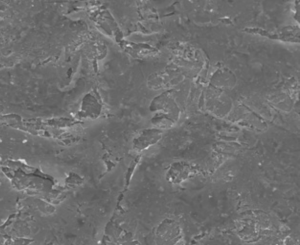 A topography is carved out according to defined parameters that results in a cell attractive topography with increased micro-roughness, enabling cells to spread over and strongly adhere to the surface. In the nano-phase, the Titanium integration layer (FGOIC Ti) is applied. For more technical details, please do not hesitate to contact us.